Some cat breeds are uniquely colored. Like horses, rabbits and other animals, one distinctive cat coloration is the so-called ‘point coloration’ or colorpoint. This coloration refers to animal coat coloration with a pale body and relatively darker extremities, like the face, ears, feet, tail, and scrotum in males. One of the cutest cat breed is the Munchkin. This unique breed of cat has abnormally short legs. Despite the shortness of its legs, it is still good in running and leaping. It is also notable for its point coloration. The Himalayan Cat is a longhaired cat breed similar in appearance to the Perisan. This blue-eyed cat is notable also for its point coloration. The neat looking and elegant Japanese Bobtail is a cat breed with an unusual "bobbed" tail and colorpoint coloration. It is an ancient cat breed that originated in Japan. One breed of cat which is notable for its colorpoint coloration is the Siamese Cat. This cat breed from Southeast Asia became one of the most popular breeds in Europe and North America in the 20th century. The cute-looking Ragdoll is a breed cat with blue eyes and a distinct colorpoint coat. It is a large and muscular semi-longhair cat with a soft and silky coat. 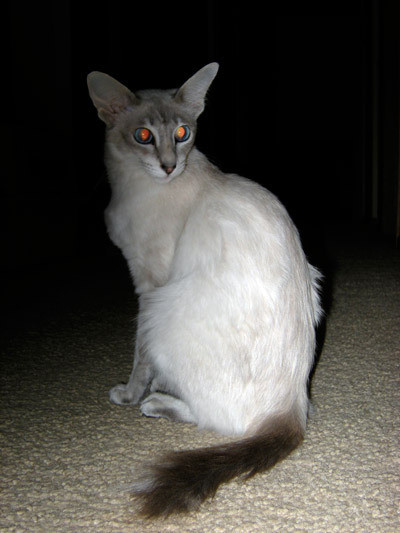 Most of the colorpoint cat breed originated in Asia particularly in the Southeast like the Balinese. It is a cat breed with long hair and Siamese-style colorpoint. This cat breed is rated the highest in intelligence of all the long-haired breeds and can live up to 21 years. It is rated 9–10 while the Persian is rated as 6 and the Himalayans as 7. The Birman is a beautiful cat breed that originated in Burma. It is also called the "Sacred Cat of Burma". This medium-long hair cat breed is pointed but the paws have white gloves. The Javanese is a cat breed with long hair with colorpoint. This cat with long, silky coats comes in different colors. Tonkinese is a cat breed distinguished by points as with Burmese and Siamese. This medium-sized domestic cat is lively, friendly, often talkative cats, with gregarious personalities. It is a happy apartment cat if they have some exercise opportunity. The last on the list of colorpoint breed of cat is the Turkish Angora. This uniquely beautiful and ancient cat breed originated in Ankara, Turkey. They are all cute. But Siamese cats have attitudes and not friendly at all. Good presentation.